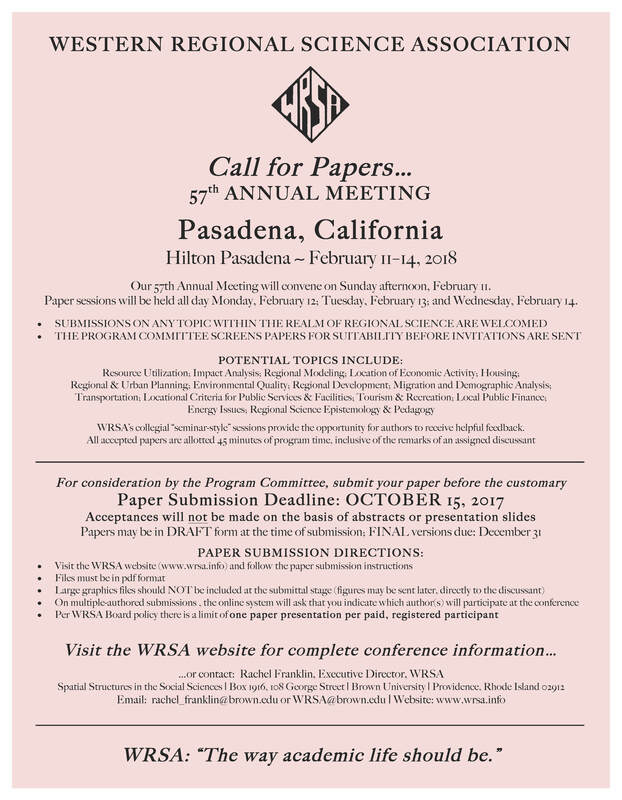 The call for papers for the Western Regional Science Association (WRSA) 57th annual meeting is open until 15th October 2017. The meeting will take place in Pasadena, California, February 11-14, 2018. This year’s WRSA meeting includes a series of Remote Regions/Northern Development sessions to accommodate social scientists who have a special interest in research on economic, social, political, and cultural issues in remote, sparsely settled regions in the circumpolar north and elsewhere. In the past, researchers from Canada, Alaska, Hawaii, Greenland, Finland, Scandinavia, Australia, New Zealand, Micronesia, Israel, and Russia have presented papers in these sessions. The Remote Regions/Northern Development sessions are in their thirty-sixth year. We are again issuing a general call for papers from social scientists doing research in northern and other remote regions. General topics include the analysis and discussion of economic, political, and social-cultural change in remote and sparsely settled regions. Examples of specific topics include: the consequences of new technology; the effects of government expenditures; the conditions for success or failure of development projects; relations between the subsistence and market economies; regional benefits and costs of development; economic integration and cultural preservation; community development; changing social patterns; Native sovereignty and federalism; migration; and institutional change and resource governance in remote regions. Papers on any topic consistent with the general theme are welcomed. We would also welcome the organization of special sessions and are particularly interested in sessions which address a particular theme from the perspective of a number of countries or regions. Please contact Greg Protasel (see contact information below) if you are interested in organizing such a session. The title and abstract of your paper is needed by October 15th. Final versions are due on December 15th for your name to appear in the WRSA program. We will be sending information about association membership, registration, hotel reservations, and related matters to those responding to this call. You can find out more about the meetings at the WRSA website. For details about registering at the conference hotel click here.